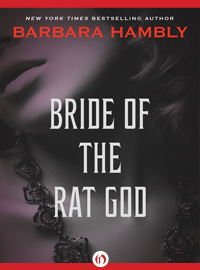 You may remember when Simeon Beresford answered these five question, he mentioned Barbara Hambly’s Bride of the Rat God twice. It and several of the author’s other works have just become available as ebooks. Her publishers sent us a video of her talking about her work, and it got us thinking. We decide we would have to ask her those five questions. Gosh, there were so many, but I’d have to go with Dorothy and the Wizard in Oz (#4 of the series, counting Wonderful Wizard as #1). Book I absolutely hated and was forced to read? (Other than the math textbooks in High School?) Old Mother West-Wind (again, a kid’s book. Mostly since the age of about 10 I read fast enough that I didn’t really HATE books, I just got through the ones I found tedious). Are you a book collector, avid library patron, or do you use the revolving door at the used book store? I collect books idiosyncratically – both for research and for reading pleasure. I don’t have much time to read, and when I’m overworked and emotionally exhausted (as I have been since about 2006) I tend to re-read favorite fiction: it’s like having the emotional equivalent of a fluttery stomach, which will only tolerate certain things. What book would I recommend to others? WHICH others? Who are we talking about? Some people I think really should read Connie Willis’s To Say Nothing of the Dog, or Georgette Heyer’s A Civil Contract, or Fred Pohl’s Gateway; others really need to read The Big Book of Alcoholics Anonymous before they go any further.